Homemade fish and chips. 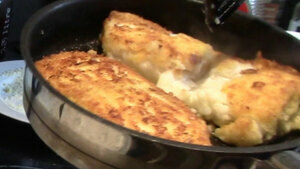 In this recipe, we will be breading fish fillets and shallow frying them. A healthy twist on a British classic. 1. Stick some chips in the oven. 2. Prepare three bowls. One with flour in, one with a beaten egg in and one with breadcrumbs in. 3. Season the flour with salt and pepper. 4. Cover the bottom of a frying pan with oil and place over a medium-high heat. Wait until it gets hot. 5. Take each fish fillet and dust it with the flour. Shake any excess off. Then dip in the beaten egg. Make sure you coat all the sides and edges. Finally, place it in the breadcrumbs, making sure you get an even coating. Lay straight into the frying pan. 6. Cook until the fish is opaque and flaky. Usually about 10 minutes.